Tie on a topwater bait just for fun. PRATT – It’s hard to think about fishing on a sweltering summer day, but when the sun sinks toward the western horizon, everything changes. 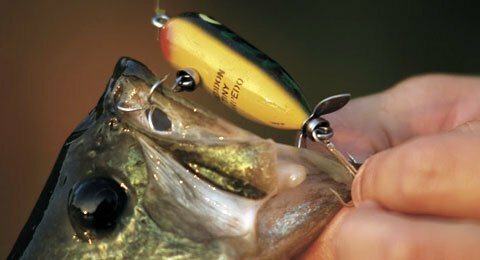 Warm water and direct sun make the bass sluggish during the day, but as evening temperatures cool, the fishing can get hot. Now it’s time to grab your bass rods and find the nearest farm pond, state fishing lake or community lake. There are thousands of farm ponds tucked away all across Kansas’ countryside, and many have great bass fishing. Anglers need landowner permission to fish private ponds except for those leased by the Kansas Department of Wildlife, Parks and Tourism and opened to public fishing through the FISH program. To find them, download the 2016 Kansas Fishing Atlas at www.ksoutdoors.com. The atlas contains maps of all FISH waters, as well as all other public fishing lakes and reservoirs. You’ll also find the 2016 Kansas Fishing Forecast, which will tell you which public waters have the best bass populations. Information thanks to the Kansas Department of Wildlife, Parks and Tourism.